Insomnia is one of the most irritating and frustrating conditions that alter our daily routines and often cause anxiety, anger, frustration, irritability and lack of energy which then leads to poor concentration or mood changes with a detrimental effect on the daily routines and possible altered eating patterns..
Insomnia is characterised by people having difficulty falling asleep then waking several times at night and not getting back to sleep. This is accompanied by frustration and worry which perpetuates the insomnia. Every day activities become overwhelming. The normal sleep patterns include awakening from sleep briefly and then returning to sleep, usually without remembering the waking periods. Short term insomnia is transient, such as worry about an upcoming exam, and when the insomnia is corrected, these conditions are then reversed and healthy sleep patterns and day time energy levels are re-established. Long term insomnia is over a long period of time and can be months and/or years. Insomnia can be caused by multiple issues and can include worry about the workplace, finances, family issues, and Carers who are caring for family members who are chronically ill or have ability challenges. Workplace and school worries can include safety, personality clashes and bullying. The bullying can be intermittent and/or long term with no relief after having made every attempt to remedy the situation through the recommended channels. The stress of not being able to sleep correctly begins to have long term effects with muscle and joint pains, eating and drinking foods that increase energy levels for short periods, as the body is attempting to work effectively without one of its essential stress release functions, that being effective sleep. The altered eating patterns has a detrimental effect on weight control either losing or gaining weight. Sometimes the original stress that caused the insomnia has been resolved however the insomnia has become habitual and worry about poor sleeping patterns may then become the stress that is causing chronic insomnia. Kinesiology uses the Triad of Health, Chemical, Emotional and Structural factors to indicate the best possible balance to maintain good health. 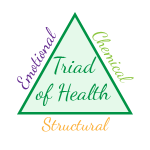 The Triad of Health is represented by an equilateral triangle with Structural, Chemical and Emotional health representing the three sides. All three sides are interactive creating a perfect balance within our bodies and should one of the sides of the triangle be imbalanced it places stress on the other two sides, creating an imbalance in the whole body system. The chemistry, the fuel that drives the whole system, is interactive in the body system and works in perfect harmony with the skeletal and muscular system which protects the vital organs while they are creating and processing the chemical balance and nutrition required for a perfectly functioning body. Kinesiology is a very powerful natural complementary therapy. Kinesiology is not a quick fix and takes time for your body to readjust to the Kinesiology Balances, taking time to create the positive long term changes for your insomnia. It is recommended that a treatment plan be implemented. This allows the client the opportunity to experience the positive changes they are seeking. A unique stress management programme is then created for you to assist with regaining your unique balance and regular sleeping patterns. When the insomnia has been addressed, the stressors causing the insomnia are then released and healthy sleeping patterns and day time energy levels are re-established.